Despite numerous technological advances, fleas continue to represent a potentially lethal plague upon our pets. Current products are effective so there is little reason for this; the problem seems to be one of understanding. There are over 1900 flea species in the world. Pet owners are concerned with only one: Ctenocephalides felis, the cat flea. This is the flea that we find on our pets (cats, dogs, rabbits, and other species) in 99.9% of cases and in order to understand how to control the damage caused by this tiny little animal, you should learn all you can about it. What Kind of Damage Can Fleas Cause? This is so important that we will say it again: Most people have no idea that fleas can kill. On some level, it is obvious that fleas are blood-sucking insects but most people never put it together that enough fleas can cause a slow but still life-threatening blood loss. This is especially a problem for elderly cats who are allowed to go outside. These animals do not groom well and are often debilitated by other diseases. The last thing a geriatric pet needs to worry about is a lethal flea infestation and it is important that these animals be well protected. Also consider that in about 90% of cases where an owner thinks the pet does not have fleas, a veterinarian finds obvious fleas when a flea comb is used. Despite the TV commercials, the educational pamphlets, the common nature of the parasite, there are still some significant awareness problems and a multitude of misconceptions.
? My pet cannot have fleas because he lives entirely indoors. Fleas thrive particularly well in the well-regulated temperatures in the home.
? My pet cannot have fleas because if there were any fleas they would be biting (insert name of a person in the family reportedly sensitive to flea bites). Since this person is not being bitten, there must not be any fleas. Despite Ctenocephalides felis? ability to feed of a wide variety of hosts, this flea definitely does not prefer human blood and won?t eat it unless absolutely necessary. A newly emerged adult flea is hungry and may well take a blood meal from the first warm body it finds. An adult flea knocked off its normal host will also be desperate to find a new host and may feed on the nearest warm body it can find. In general, adult fleas regard human blood as a last choice and humans tend not to be bitten unless flea population numbers are high.
? We do not have fleas because we have only hard wood floors. Fleas love to develop in the cracks between the boards of hard wood floors.
? My pet cannot have fleas because I would see them. You cannot expect to see fleas as many animals are adept at licking them away. Sometimes all that is seen is the characteristic skin disease. Fleas are adaptive and their life cycle is always active: eggs are laid, larvae are developing, pupae are growing, etc. The environmental temperature controls how fast this occurs. If you want to eradicate the flea population in a specific home, it is best to attack when numbers are low in the winter. It is a mistake to stop flea control products in the winter as it will be much harder to gain the upper hand in the spring and summer when the populations are rising. The MORAL OF THE STORY IS THAT FLEAS SHOULD NOT BE UNDERESTIMATED AND IT IS IMPORTANT TO HIT THE FLEA POPULATION WHEN IT IS WEAKEST. HIT THEM HARD!! Learn it, know it, live it. There are four life stages of the flea and it is important to know how to break this life cycle in more than one place. This two-step approach provides the most rapid control and the least resistance to flea control agents in future flea generations. At any given time about one third of the flea population in someone?s home is in the egg stage. The adult female flea lays up to 40 eggs daily. The eggs are laid on the host where they fall off to hatch in the environment. Eggs incubate best in high humidity and temperatures of 65 to 80 degrees Fahrenheit. (18.3-26.6 Celsius). At any given time about 57% of the fleas in someone?s home are in the larval stage. Larvae are like little caterpillars crawling around grazing on the flea dirt that is generally in their vicinity. Flea eggs and flea dirt both fall off the host. 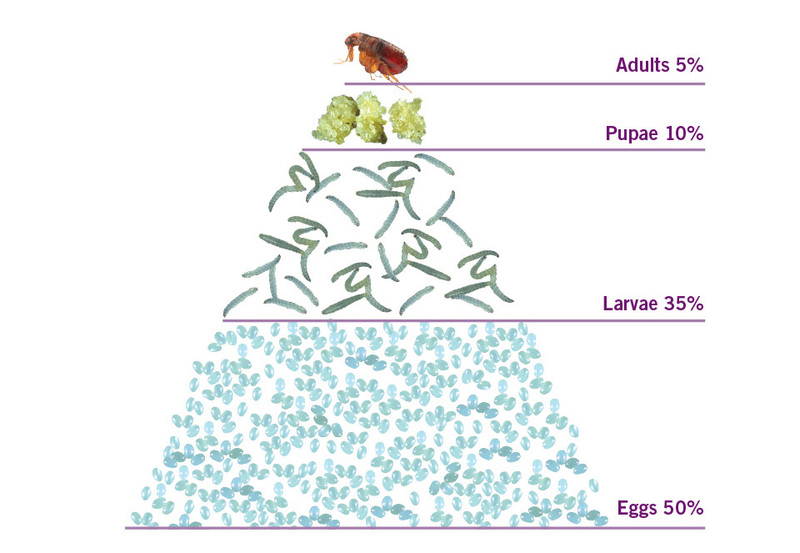 When the eggs hatch, there is a bounty of food prepared lovingly by all the host?s fleas waiting for the hatchlings. This is the stage that picks up tapeworm eggs, which are likely to be in the vicinity, as they graze. As they get to a certain age and size, a molt occurs. The first larval stage is called the first instar. After the first molt, the larva becomes the second instar. After the third molt, the larva is called a third instar larva and is capable of spinning a cocoon and pupating. The time between hatching and pupating (i.e., the time spent in the larval stage) depends on environmental conditions. It can be as short as 9 days. Note: Larvae are killed at 95 degrees. This means that they must live in some area where they are protected from summer heat. This means the shade of the yard or indoors. By this life stage most young fleas have been killed off by an assortment of environmental factors. Only 8% make it to the pupal stage but once they have spun cocoons they are nearly invincible. The cocoon is sticky and readily picks up dust and dirt. Inside the developing cocoon, the pupa is turning into the flea that we are familiar with. They are especially protected under carpet, which is why carpet has developed such a reputation as a shelter for fleas. The pupa can remain dormant in its cocoon for many months, maybe even up to a year as it waits for the right time to emerge. After the pupa develops, it does not automatically emerge from its cocoon. Instead, it is able to remain in the cocoon until it detects a nearby host. The mature pupa is able to detect the vibrations of an approaching host, carbon dioxide gradients, and sound and light patterns. When the mature pupa feels the time is right, he emerges from the cocoon, hungry and eager to find a host. A common scenario occurs when a dog is boarded during the owner?s vacation. The owner picks up the dog from the boarding kennel and returns home. The mature pupae have been waiting for a host and when the dog enters the home, a huge number of adult fleas emerge at once and attack the dog creating a sudden, heavy infestation. Often the boarding kennel is blamed for giving the dog fleas. What really happened was that the pupae waited to emerge while there was no host present and then they all emerged suddenly when the host arrived. unfed flea is able to live for months without a blood meal but during that time it is aggressively using all its powers to locate a host. Once it finds a host, it will never purposely leave the host. After the adult flea finds a host and takes its first blood meal, metabolic changes occur that alter the flea forever. The flea is now called a fed flea and, if separated from its host, will die in only a few weeks without a blood meal. The female flea begins to produce eggs within 24 to 48 hours of her first blood meal and will lay eggs ? more than 25 a day! - continually until she dies. The average life span of the adult flea is 4 to 6 weeks, depending on the grooming abilities of the host. On average, the time period from egg to adult flea is about 3 weeks. A larva whose mother has had a big drink of lufenuron-laden blood will not be able to hatch. Another such sterilizer is methoprene (the ?plus? in Frontline Plus). Methoprene was developed as an additive to flea sprays and foggers. It is totally non-toxic - it doesn?t even kill fleas - and represents a group of insect control agents called insect growth regulators or juvenoids. Methoprene mimics a youth hormone of the flea so that larvae who consume it in flea dirt cannot mature and eggs laid by female fleas who have been topically treated with it cannot develop. Q: On a given dog or cat, sometimes the fleas look smaller than average. Are these baby fleas? A. No. Remember the flea life cycle. The fleas you see on a dog or cat are adult fleas. They vary in size depending on the nutrients they got in prior development as well as individual genetic make-up. Adult fleas have an exoskeleton made of chitin, as do all insects. They can?t grow bigger than they are. Q: Why is buying product from the Internet or from the pet supply store some kind of a big deal? A: With the flea product revolution of 1995, the market for flea products changed from being primarily pet supply store / over-the-counter outlets to primarily directly through veterinarians. The pharmaceutical companies like this arrangement as they feel that their products are now being marketed by trained personnel who can explain best how the product should be used or not used. The veterinarians also like this arrangement as they have more input regarding what their patients are using. The pet supply stores do not like this arrangement at all as they have lost their market-share. In an effort to gain it back, they have resorted to a number of black market techniques (paying large sums of money to veterinarians to order product for them, going to other countries to buy product and smuggling it back to the <?xml:namespace prefix = st1 ns = "urn:schemas-microsoft-com:office:smarttags"> U.S. for re-sale, even counterfeiting product). We caution anyone who buys flea products from a black market source. Product purchased through pet supply stores or from an online source that is not a veterinary hospital is not guaranteed by the manufacturer.